Laser Hair Removal - The Permanent and Fast Choice for Hair Removal. What can I expect during laser therapy? How do I prepare for laser hair treatment? What can I expect after laser hair treatment? We use the GentleLASE laser, the premier laser machine on the market today that has a special cooling system for skin that makes the experience much more comfortable than other lasers. We also value your time. Our individual laser hair removal sessions are fast due to the largest “spot size” on any laser in the industry - this means that patients are subject to fewer laser pulses for the same laser treatment area- maximizing comfort while minimizing time. Many patients who have been using electrolysis or lasers with smaller spot sizes immediately switch to our laser treatment system once they understand its advantages. 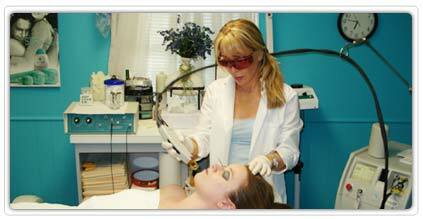 Laser is a procedure approved by the FDA. It is safe for ages 12+, comfortable due to Candela’s special cooling system, and effective for the entire body. Pigmented Lesions, these include sun damaged skin and age spots. We want you to know about our services. Understanding the technology behind your treatments will help you to get better results. The laser creates a beam of high-intensity light that penetrates deep into skin tissue where it delivers a controlled amount of therapeutic heat. Candela’s patented Dynamic Cooling Device (DCD) technology protects the upper layers of your skin with a cooling burst of cryogen. Together, the long-pulse laser and DCD cooling offer optimal treatment with minimal side effects. Treatment will take place in your the GentleLase office in Vienna, Virginia. You will wear safety eyewear to protect your eyes from the laser light. The practitioner will guide the laser to the treatment areas using a small handheld probe that emits the laser light in pulses. Each laser pulse may be preceded and followed by a short pulse of cooling spray. A treatment could take as little as a few minutes to as long as an hour, depending on the area and condition being treated. Some patients may feel a slight discomfort with the laser pulse, sometimes described as the snapping of a rubber band on the skin. The discomfort is minimized by Candela’s DCD cooling. For some patients, a topical anesthetic may be used prior to treatment. Be sure to discuss this with the GentleLase practitioner. GentleLase does not recommend nor prescribe anesthetic in any form. You should consult your medical doctor prior to using topical anesthetic. Due to the growth cycles of the hair, as we describe in our technical paper on Normal Hair Growth and Its Control, the number of sessions depends on the laser treatments you require but also on the condition of your skin. For hair removal, most people require at least 2-3 laser treatments, as the process is only effective when the hair follicle is in its active growth stage. Other conditions may clear in as few as one treatment, but many factors impact the efficacy of individual laser treatments, including the severity of the condition being treated. Patients scheduled for hair removal should avoid suntanning, electrolysis, and/or hair waxing for six weeks prior to treatment. If you have a history of perioral herpes and are scheduled for facial hair treatment, prophylactic antiviral therapy may be prescribed. Also, any hair should be shaved and your skin thoroughly cleaned and dried prior to coming in for treatment.